ALL PAINT RIVER LLEWELLIN SETTERS IN OUR BREEDING PROGRAM ARE REGISTERED WITH THE AMERICAN FIELD DOG STUD BOOK (FDSB) AND ARE DNA’D CERTIFIED FOR PROOF OF PARENTAGE. WE ARE A REGISTERED BREEDER WITH THE FDSB. OUR DOGS RECEIVE THE MOST ADVANCED GENETIC TESTING AVAILABLE IN THE COUNTRY AND GOLD STANDARD HEALTH SCREENINGS. VISIT OUR ABOUT PAGE TO LEARN ABOUT HOW WE SELECT OUR BREEDING DOGS. VISIT OUR SIRES & DAMS PAGES FOR PROFILES OF ALL OUR BREEDING DOGS. PLEASE READ ENTIRE PAGE BY SCROLLING DOWN FOR ALL NECESSARY INFORMATION. THANK YOU. Join PRL in helping you learn how to raise your bird dog pup! We are committed to seeing that all our pups succeed. We are here for you every step of the way! RESERVING A PUP FROM PRL: All current puppies and planned breedings are listed on this page. Please read and scroll down. We are always accepting reservations on current and future litters. A nonrefundable deposit of $600 is required to reserve a Paint River Llewellin Setter puppy. In the event that you have a late reservation and there are more reservations than pups born, your reservation is automatically transferred to the next litter where pups are available or you have the option to wait for your female’s next litter. Please understand this might be one year later. Starting our Fall 2020/Spring 2021 breeding season all PRL puppy purchasers will be required to purchase the PRL Vimeo On Demand video series. We want to insure that every step is taken by us to help your puppy succeed not just in our efforts in our breeding program but in our raising program. PRL CLIENT SALE POLICY: WE DO NOT SELL TO INDIVIDUALS WHO INTEND TO BREED OR COMPETE IN TRIALS AND TESTS WITH THEIR PUP. WE SELL OUR PUPS TO FAMILIES THAT ARE LOOKING FOR A LOVING FAMILY COMPANION THAT HAS EXCELLENT BIRD DOG POTENTIAL ON WILD BIRDS. WE WILL RETAIN BREEDING RIGHTS TO SOME OF THE MALE PUPPIES/DOGS WE SELL, WHICH WOULD BE DISCUSSED PRIOR TO BUYER MAKING A DEPOSIT. THERE IS A “NO BREEDING” CLAUSE IN OUR SALES CONTRACT WHICH YOU CAN READ BELOW ON THIS PAGE IN THE PDFs LISTED. DUE TO THE SOFT INTELLIGENT NATURE OF OUR SETTERS— PRL PROHIBITS THE USE OF FLANK COLLARS IN TRAINING STEADINESS AND CLASSIC FORCED FETCHING METHODS ON OUR PUPPIES IN THEIR DEVELOPMENT. THESE METHODS WORK WELL COLLECTIVELY FOR MANY BREEDS AND TYPES WHEN DONE PROPERLY. HOWEVER, CERTAIN LINES OF SETTERS, INCLUDING OURS, THAT HAVE A SOFTNESS AND VARIABLE TRACKING/STALKING/POINT STYLE THAT DOES NOT DO WELL WITH CERTAIN TRAINING TECHNIQUES. WE BREED SETTERS THAT WILL STALK AND SET AT TIMES. FLANK COLLARS STAND THE POTENTIAL TO DISALLOW OUR SETTERS TO BE SETTERS TO A DEGREE. WE WANT TO INSURE THAT ALL OUR BUYERS ARE ENCOURAGING THEIR PUP TO BE WHAT WE HAVE BRED THEM TO BE. PUP DEPARTURE: In the event PRL plans on keeping a pup(s) from a litter, PRL may not select clients’ pups until 12 to 16 weeks of age. Otherwise pups are scheduled to depart or be picked up by their new owners around 8 weeks of age. Litter schedules and details are listed individually below. 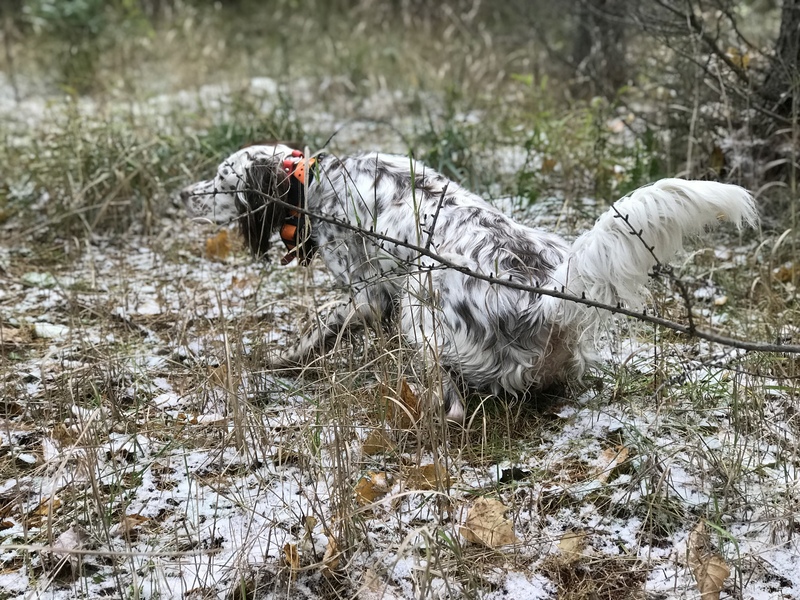 OUR DOGS ARE OUR FAMILY: We breed for quality, not quantity— there are only so many litters in a given calendar year and we look for the very best hunting-family homes we can find. PRL HEALTH GUARANTEE: Our Llewellin puppies have their dewclaws removed, receive several dewormings, and one or two vaccines depending upon age at the time of pick up. Paint River provides a three-year health guarantee, providing you follow our health and replacement puppy guidelines, on any congenital diseases that visibily impact the dog’s health. COMPREHENSIVE GENETIC & HIP SCREENINGS: PRL uses Embark Veterinary (click on this link to learn some more) the leading advanced DNA testing company in the country. Embark Veterinary is a research partner with the university of Cornell. Our Breeder Kit tests for 175 different genetic disorders, inbreeding coefficients, genetic relatedness for mean kinships, cross referencing levels and locations of homozygosity and so much more! All our breeding dogs undergo this testing in addition to a vet exams for overall total body health for heart and eyes, in addition, with the OFA and PennHip certifcations. That’s not all! We are well educated in canine genetics through many courses including but not limited to many of the courses offered by the Institute of Canine Biology (ICB). Using the ICB Breeder Tool we work closely with the Institute of Canine Biology (click on this link to learn more) and the Embark geneticists with the most cutting edge and informative testing on the market today! No other company and team of geneticists in the country has more comprehensive testing! FOLLOW PRL:Please follow us by subscribing to our site by email so all posts go directly to your inbox!! A nice advantage by going with Paint River Llewellin Setters is that you get play by play videos every day of your pup’s development from 4.5 weeks until departure!!! It is wonderful to see them grow not just by photos but in animation, in real action. It does not get any more personal and heartwarming than a Paint River Llewellin experience in the weeks leading up to your pups grand home arrival. SOCIAL MEDIA LINKS:Our Facebook page Paint River Llewellins and our Instagram page at paintriverllewellins provides non-stop action as these pups grow one a daily basis! MUST LIVE IN N. WI, E. MN, OR UP/N.L.P. Omiimii is a grouse finding machine. She hunts like a cat as much as any I’ve ever seen. 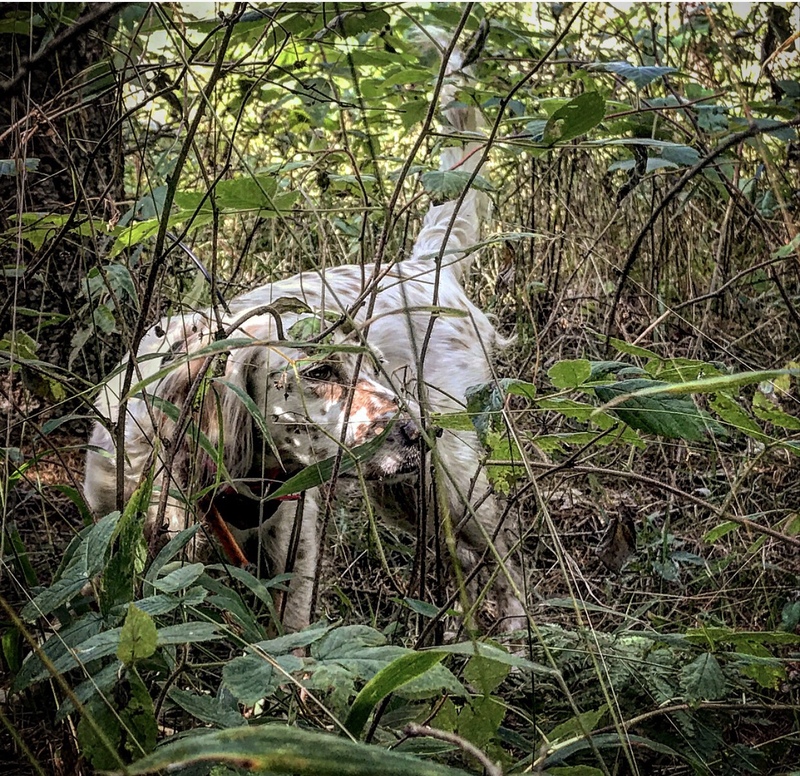 She has an average nose but my most stealthy tracker that has incredible focus and over the years has trailed hard running ruffed grouse over hundreds of yards into a beautiful point for the perfect shot opportunity. Omiimii is very cautious in the grouse woods with incredible natural staunchness. Omiimii naturally honors. This little girl is a fantastic grouse dog. She checks in often and hunts for the gun beautifully in a quick and slow manner. Omiimii’s range is 0 – 50 yards (first season range was up to 90 yards), averaging 20 – 40 yards. She is my most heat tolerant girl of the entire pack. She has produced the very best natural retrievers PRL has produced to date. Every friend and client that has hunted over all my dogs all favor Omiimii in the grouse woods. She is such a fun dog to hunt behind. Omiimii weighs in at 30 pounds. See more photos and learn more about Omiimii on our Dams page and on social media as you scroll back during the hunting season months. Widget is one of the most incredibly intelligent dogs I’ve been around with one of the most emotional personalities, which has both its pluses and minuses. Around the home, she is known as my dog-wife. Widget is a serious talker, in my experience a sign of great intelligence. She’s a dominant girl with a huge ego. Widget’s hunting abilities are second to none— with a superior nose, incredible staunchness, she is a very cautious cold nosed cat-like hunter in the grouse woods. She is an exceptional natural honoring dog. She is one of the greatest grouse dogs I’ve seen in my hundreds of dogs in the woods. She checks in often and hunts for the gun beautifully at a nice slow steady pace. Widget’s range is 0 – 60 yards, averaging 25 – 50 yards. She produces a high percentage of good quality natural retrievers. She weighs in at 42 pounds. See more photos and learn more about Widget on our Dams page and on social media as you scroll back during the hunting season months. Pixel is a PRL veteran. She’s a very quiet natured dog with a dominant presence. 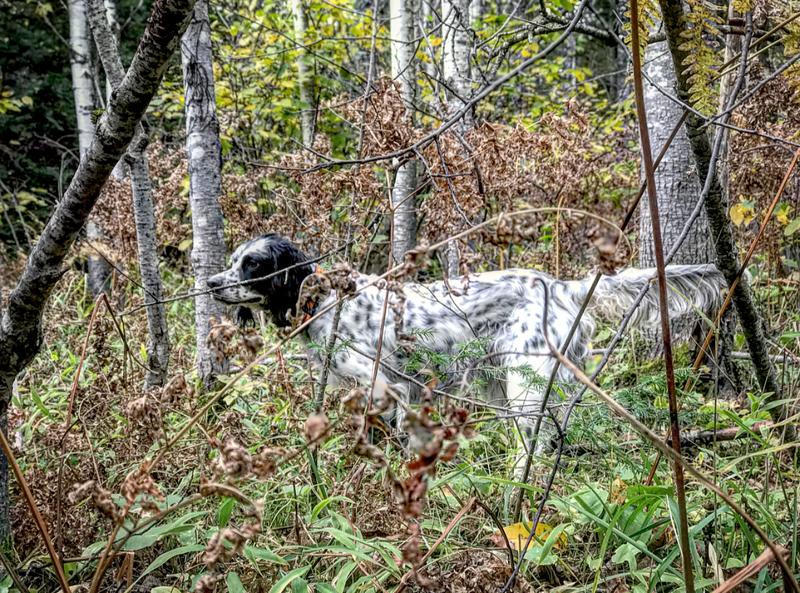 She’s a fabulous grouse dog— easy handling, hunts at a beautiful lope and checks in often. She’s a very true dog, always has been. If she’s on point a bird will be produced 95% of the time. She’s is a highly reliable hot nosed pointer. She’s most often not far but sometimes you have to walk to her point a bit. Pixel’s range is 0 – 100 yards, averaging 40 – 70 yards. Incredibly quick to honor her brace mate in the the grouse woods. Fantastic at locating wounded birds over any distance. I refer to her as my classic, no frills, get the job done setter. Pixel has the highest percentage of highest quality pups (our bar is very high) as a producer in PRL breeding history across being paired with three different sires thus far. Both her male and female offspring are highly consistent. She produces a high percentage of good quality natural retrievers. Pixel weighs in as my largest female, at 47 pounds. See more photos and learn more about Pixel on our Dams page and on social media as you scroll back during the hunting season months. Stella is a phenomenal grouse dog. Quality nose, naturally points, backs, and retrieves. Stella’s range is 0 – 75 yards, averaging 30 – 50 yards. She checks in every few minutes and hunts for the gun nicely. She has a beautiful gait and moves smooth through the grouse woods. A very true dog, if she goes on point the bird is usually going to flush soon thereafter. Stella has a very soft mouth when handling birds. Just a pleasure in every respect. Stella is a calm, quiet, sweet girl that doesn’t care in the least about social status among other dogs. Stella weighs in at 38 pounds. See more photos and learn more about Stella on our Dams page and on social media as you scroll back during the hunting season months. Missy is a spectacular grouse dog. She has an exceptional nose, naturally points, backs, and retrieves. Missy’s range is 0 – 60 yards, averaging 20 – 40 yards. She checks in every couple minutes; if ever out of sight in the first place and spot on hunts for the gun. She’s unbelievably light on her feet. Missy’s hunt style is more cat-like and may stalk and point in closer to the bird to set up a shot opportunity. Missy is a calm, quiet, sweet girl that doesn’t care in the least about social status among other dogs. Just a real gentle nature about her. Missy has a very soft mouth when handling birds. Missy weighs in at 38 pounds. See more photos and learn more about Missy on our Dams page and on social media as you scroll back during the hunting season months. Azaadi entered her first grouse season at just turning 5 months old. She could not have shown more promise. 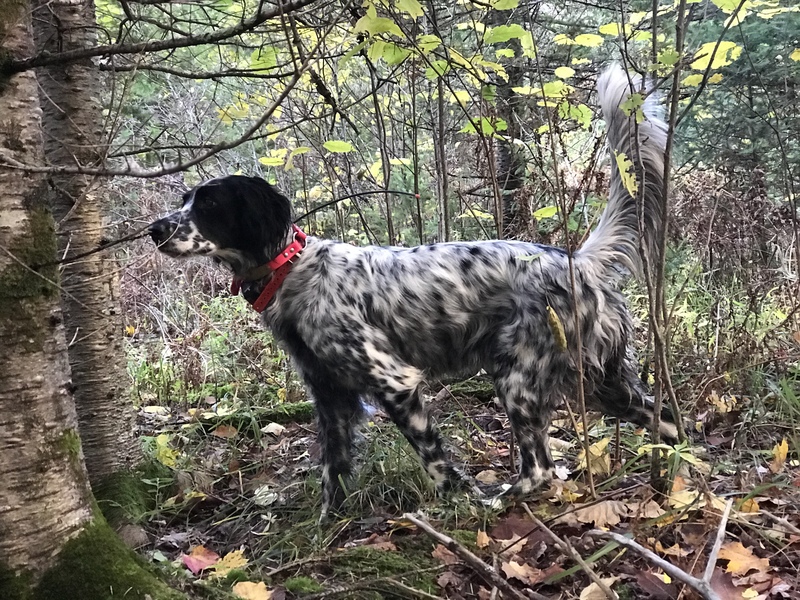 From late Sept. – early Nov. this little pup out of our Royals Litter, Omiimii by Chippewa, achieved 100 grouse points, 21 grouse retrieves to hand and dozens of woodcock pointed and shot over her as well. Azaadi has an incredible nose and has really learned well how to work these crafty birds with all of her exposure. Solid pointer and amazing retriever. She’s increasingly learning to work these running ruffs with quality paced tracking. Azaadi’s range is 0 – 90 yards, averaging 40 – 60 yards, in her first season, still at only just 7 months old. She’s an intelligent, fiery little girl that we hope to continue to see big things out of. Super nose, incredible retriever and great stamina. Azaadi weighs in at 34 pounds. STANDBY RESERVATIONS: In the event, we are not currently taking deposit reservations on a litter of interest to you. You are welcome to go on standby in the order requested if additional puppies are available after all prior depositors have claimed a born pup. We take deposits for stand-by reservations. In the event we do not have a pup available for you in the gender decided at the time of making the reservation then we will refund your “standby deposit.” If PRL has a standby pup available in the mentioned gender and you have decided you no longer want the pup then your standby deposit will not be refunded. TO ALL PUP INQUIRERS: Serious inquires only, please. All great family dog homes will be considered that are able to provide active recreational lives for these pups. Hunting-family homes get priority. All PRL puppy owners must own their own home, have a fenced in yard (physical or electric) and have their PRL pup live indoors with them as a family companion. PRL PUP PURCHASE INFO: We ship anywhere in the USA. Paint River Llewellin Setters cash puppy purchase price is $1,800 (for puppies up to 12 weeks of age), plus any shipping expenses, which include shipping crate, airfare, health certificate, and cost of travel to the airport. Total shipping expenses of $550 are in addition to puppy purchase price. Individual litters will sometimes have a different cost per puppy. Those litters will be labeled as such when they start to be advertised. In the event we need to raise our puppy purchase price when you have a reservation you are responsible for the most current price on our pups, sometimes we need to raise our prices to ensure giving the dogs the best possible care when our expenses increase. If there is a price increase it would likely occur when the stud is selected late summer. You are welcome to have your non-refundable deposit refunded strictly due to this reason as we would never force you into contract not knowing your financial obligation. Thank you. Remaining balance of $1200 from the cash purchase price (this is balance on pups up to 12 weeks old price may be higher on older pups) balance due when pup is two weeks old. NO LATER! If not paid at that time you forfeit your deposit and pup NO EXCEPTIONS.